» Are You Not Entertained? 1. Should it matter that Popovich is the most respected coach in the league (and therefore warrants special treatment)? 2. Would it have made a difference if the Spurs had still won the game (which they almost did)? 3. Is the NBA schedule too taxing? 4. Is Stern unnecessarily draconian? 5. 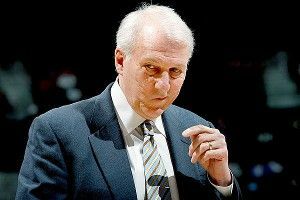 Was Popovich consciously trying to poke the bear? 6. Would this have been less problematic if Popovich had warned the league of his decision in advance? 7. Did ticket buyers in Miami deserve a refund? 8. What responsibility does Popovich have to TNT (the network that broadcast the game and potentially lost viewers because of who wasn’t playing)? 9. How is this different from teams who tank games at the end of the year in order to qualify for the draft lottery? I would respond to those nine questions with the following nine answers: “Sort of,” “yes,” “not really,” “usually,” “yes,” “no,” “no,” “more than most people realize,” and “not at all.” But these mini-questions were not what’s interesting about this problem. In fact, I suspect those minor issues were mostly being analyzed as a way to avoid the deeper question this conflict demands, simply because the answer is too big to reasonably confront. The question is this: What are we really doing here? Now, I don’t mean, “What are we really doing here on Earth?” What I’m asking is, “When a dilapidated version of the Spurs plays the Heat in late November, what is actually at stake?” I’m wondering about the central purpose of pro sports, and how much of that purpose is directly tied to entertainment. It’s a complicated question that keeps folding back upon itself: In order for a Spurs-Heat game to be entertaining, it has to be competitive; in order for the game to be competitive, the outcome has to matter; in order for a regular-season game in November to mean anything, the outcome of the NBA title has to mean a lot. And if we’re going to accept the premise that the outcome of the NBA Finals is authentically important (and that who wins the title truly matters), then this whole experience needs to be more than casual entertainment. Popovich is a beloved, admired coach who appears actively unconcerned with the entertainment requirements of basketball (which is how most serious fans would insist they want him to behave). He’s exclusively concerned with real competition over the long term, particularly in the month of June; everything else is a distraction. Stern’s essential rebuttal is that pro basketball only exists because pro basketball is fun to watch (and if you ignore its entertainment import, the rest of this will all disappear). He’s concerned with short-term competition on a night-to-night basis, which translates into an entertaining product overall. That dissonance between Popovich and Stern is what forces my question. If what makes sports entertaining is the degree to which the games matter, should we value competition above all other factors, even if doing so occasionally makes things less entertaining? Because that’s what happened in Miami. This AT&T commercial never ceases to disturb me (which, I will grant, is mostly my own fault). We see a high school football player involved with a marginally crazy play during practice, captured on the phone of an anonymous peer who likes to invent unoriginal catchphrases. The footage goes viral and the player becomes famous — so famous that he gets recruited by Oklahoma football coach Bob Stoops, apparently because Stoops needs more undersize tailbacks who can flip 360 degrees and continue downfield. It’s a modern concept, informed by modern values. It has nothing to do with the experience of competition. It’s not like the kid wins the city championship and is able to re-experience that victory through his parents’ smartphone; it’s a celebrity-driven narrative that suggests technology has the power to make a player nationally famous from one moment that didn’t even happen in a real game (which, of course, is true). It’s the new way to dream about sports. I hate this commercial. It’s glib and insidious. However, I only hate it because it’s fiction. I hate that someone at AT&T figured out a way to monetize the fact that high school football players care more about themselves than they care about football (which has probably always been the case, truth be told). And here’s what’s really stupid: I wouldn’t hate it if it happened in reality. If a real kid got a scholarship to Oklahoma because of this kind of scenario, I would be charmed. Anytime a real athlete’s individual performance outshines the unsophisticated concept of winning or losing, I inevitably love it. His or her motives are almost an afterthought. I only find it troubling when the scenario is fake. Fiction is always more real to me. Just before Thanksgiving, a Division III basketball player for Grinnell College scored 138 points in one game. The player, Jack Taylor, went 52-of-108 from the field; the rest of his team spent the entire game relentlessly feeding him the ball so that he could launch trey after trey after trey (their next-highest scorer had 13 points). Grinnell uses a “system” where they full-court press the whole game and concede layups if the press is broken (a player for Grinnell’s opponent that night, Faith Baptist Bible College, had 70 points himself). When I read about this game the next day, I was ecstatic. I’ve often wondered how many points a basketball player could score if that was the only goal, and this is the closest we’ve come; the fact that Taylor shot only 48 percent from the floor makes me think the real number is closer to 175. I didn’t see any downside to this event, mostly because (a) it occurred in a game that meant almost nothing, and (b) the statistical absurdity of the total kept the accomplishment from seeming more important than it was. It was totally fascinating, but nothing more. Personally, I’d be happy if this became a trend in the low end of Division III basketball. I’d like to see a space race to 200 points. My reaction, however, was not universally shared. Almost every major news report about this game was tinged with mild distaste: It was cheap, it was galling, it was a gimmick to get on SportsCenter, etc. Now, I disagree with those reactions. I don’t see why it would have been better for Grinnell and Faith Baptist to play a 54-51 game that would be totally lost to history. I wouldn’t want every basketball game to be like this, but that’s not a real risk. It strikes me as rather stupid to be upset that some random kid scored 138 points in a basketball game that no one would have known about otherwise. It was a cool explosion. But then I thought about this performance is a different way: What if this game had been an AT&T commercial? What if I saw a commercial in which a basketball team sacrificed every traditional, competitive impulse so that one kid could score every single point, and this was celebrated as a brilliant way to demonstrate the power of a 4G network? I’m sure I would hate it. And I would hate it because it would force me to consider what I’m supposed to like about sports, as opposed to just watching the games and feeling good. Perhaps you think this is an imaginary problem. Perhaps you say, “Just don’t worry about it and the problem will disappear.” Maybe so. But the conflict keeps coming up in weird ways. The most consistent trouble spot involves the rise of advanced statistics, and specifically how much we need to care about them. Right now, in pro football, there is strong statistical evidence that insists teams should punt less on fourth down (even if it’s fourth-and-4 and they’re at midfield). Some of the logic behind this theory is irrefutable and some is harder to accept.2 But if you’re one who believes that this axiom must be embraced for its mathematical veracity, it probably means the reason you’re watching football is because you really care about the outcome. That’s why you’re watching the game. It means you believe offensive and defensive coordinators should make all their decisions based on rational probability, almost like they’re simulating the game on a computer (and if they make these same rational decisions 10,000 times, they will succeed more often than they fail, which should be the ultimate goal). It means you believe that the most important thing about a football game is who wins and who loses, which is fine. Except that it makes the whole endeavor vaguely pointless and a little sad. For sports to matter at all, they have to matter more than that; they have to offer more cultural weight than merely deciding if Team A is better than Team B. If they don’t, we’re collectively making a terrible investment of our time, money, and emotion. This is why the recent Spurs-Heat situation mattered — it raises real questions over what we’re supposed to care about when we watch 30-year-old millionaires participating in a schoolyard game with made-up rules. What matters is not the outcome of Miami–San Antonio, but how important that outcome was to begin with. So within this debacle, who was justified? Who was on the right side? My natural, non-thinking inclination is to side with Gregg Popovich. It seems like a head coach should have autonomy over how he runs his team; if Popovich believes the Spurs’ likelihood of winning an NBA title is better served by resting Duncan and Ginobili in November, I believe he’s probably right. I am emotionally motivated to side with him, because his position makes it seem like sports are more important than the people watching them on TV (which is what I want to feel). Yet — in my head — I know that David Stern is right. There was a period in my life when I thought Stern was a genius, and then another period when I thought he was hurting basketball more than he was helping it. I suspect he’d be a terrible person to work for, or with. But now that he’s a year from retirement, I’ve come to realize his primary achievement represents the most important thing any sports commissioner can do — he always made it clear that someone was in charge. His edicts are sometimes infuriating, but they’re always enforced for the same motive. He always sees the biggest possible picture. Stern holds an inflexible vision of how the NBA should operate, and he’s never wavered. And though he would (probably) never admit this directly, his vision of how the league should exist can be understood through his fining of the Spurs for insubordination: The NBA will always provide the illusion of competitiveness, which fans will unconsciously accept as viable entertainment. If you turn on an NBA game, you will see the game you expect (and will be able to pretend that it’s exactly the game you desire). You will get what you think you want, and any question over what that should (or should not) be will not factor into the equation. And if it does, somebody will get fined $250,000. So that’s what’s really going on here. I like when teams go for it on fourth down, and I support any reasoning for doing so. I believe it’s (probably) a winning strategy. But there’s something about the overwhelming mathematical logic of going for it on fourth-and-4 at midfield that doesn’t seem complete to me. I’m assuming someone in the comments will explain to me why I’m wrong about this (and I won’t disagree if you do), but — as of yet — no one has adequately convinced me of why my counterargument is flawed. Here’s my confusion: The reasoning behind going for it on fourth down is built on the base rate of success, which can be calculated here. I do not doubt these calculations. However, isn’t part of the reason the numbers suggest going for it on fourth down at least partially because almost no one regularly does so? Statistics aren’t predictive; they can only show us what happened in the past. So if going for it on fourth-and-4 at midfield is still a relative rarity, isn’t the available data for its rate of success questionable? And isn’t it buoyed by the specific situations in which it occurs? I mean, what kind of team tends to go for it on fourth-and-4 from midfield? It generally seems like it’s teams who are desperate (and sometimes facing a prevent defense) or teams who feel confident that they have the personnel and the play-calling acumen to succeed (most notably the Patriots). But let’s say every team started doing this, all the time (which appears to be what the stat-heads want). Won’t the base rate drastically change in potentially unexpected ways? Or let’s say only three NFL teams suddenly decide they’re going to apply this theory wholesale, but those three teams are the Browns, the Chiefs, and the Jaguars. Wouldn’t this wreck the metric? Or would it somehow prove it? Why do I find myself suspecting that — if absolutely everyone started going for it on fourth down — advanced statisticians would respond by telling teams they should consider punting?